At the Races: A Better Way Out? 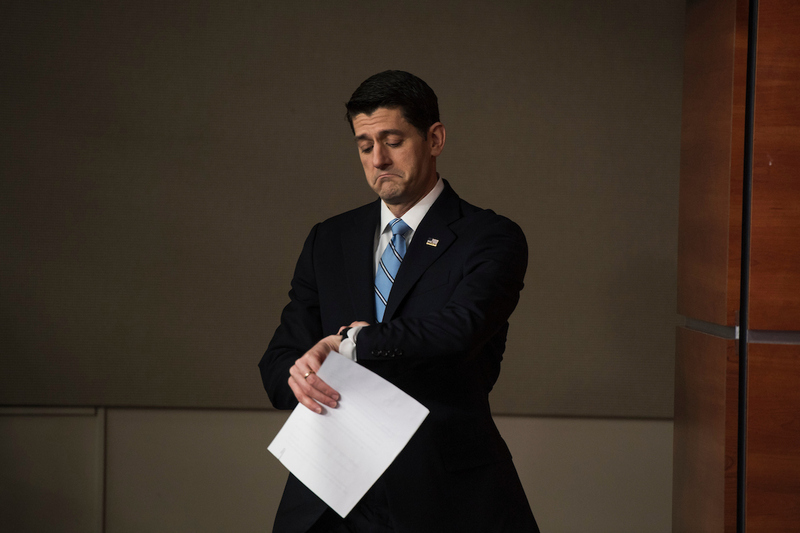 Bye Bye Ry: Speaker Paul D. Ryan made the surprise announcement Wednesday that he is not running for re-election, which some are taking as another sign that 2018 is going to be a tough year for House Republicans. One GOP operative didn’t mince words: “It’s over,” he said Wednesday afternoon. Former NRCC Chairman Tom Davis put it a little more gently: “You don’t want the captain leaving the ship.” In particular, Ryan’s exit raises questions about the party’s fundraising moving forward. Ryan’s retirement also opens up his seat in southeastern Wisconsin. A number of Republicans have been mentioned as potential contenders. The eventual nominee could face a candidate who already has a lot of cash: Democrat Randy Bryce, should he win his primary. But Republicans are confident the seat will stay in their column. Read more about their reasoning and potential candidates here. But Ryan’s retirement does put the seat in play. Inside Elections’ Nathan L. Gonzales shifted the race rating from Solid Republican to Leans Republican after news of Ryan’s decision broke. *BOOKMARK* Want to know which states’ members could still call it quits? Check out Roll Call’s Midterm Guide, which includes the filing deadlines for every state’s congressional races. Mirror, Mirror, on the Wall, Who’s the Trumpiest of Them All? It’s become a cliché that this year’s three-way GOP Senate primary in Indiana is the ugliest Senate primary in the country, with West Virginia tied or in close second. There are no former federal prisoners on the ballot here; just three graduates of Wabash College, a small all-male private school. With few policy differences among them, the race has quickly devolved into a Trump loyalty contest. Simone and photographer Tom Williams spent last week on the road with the three Republican candidates. Because who doesn’t love some fried Alaska pollock?Just Tariffic: With the prospect of a trade war with China, the potential impact of tariffs on U.S. exports started to play out in some key Senate races. Things are especially complicated for Republicans hoping to expand the majority. Catch up on how the issue is affecting races in rural states — including Indiana, where the politics are a little more complicated. The Brothers Braun: So you’re tired of reading about lawmakers leaving Congress because they want to spend more time with their families? Well, here’s a story about two brothers, both businessmen-turned-state-legislators, who want to come to Congress. That’s where the family part ends, though. They’re not campaigning together and they give off pretty different vibes. Steve Braun maxed out to one of the opponents of his brother Mike in the Senate primary. And Mike’s consultants are working for one of Steve’s opponents in the 4th District primary. Read much more about the brothers (including which one showed up to a Cracker Barrel in a Porsche) in this profile from Indiana. Great Scott! In a wild news week so far, it might feel now like Florida Gov. Rick Scott launched his Senate campaign a month ago #ThanksPaulRyan. But it was Monday when Scott announced his long-awaited challenge to Democratic Sen. Bill Nelson, giving way to what’s likely to be one of the most expensive races in the country. Nathan shifted the race rating from Tilts Democrat to Toss-up. With Wednesday’s news, we’re now up to 25 Republicans who are not seeking re-election or higher office in 2018. In addition to Ryan, Florida GOP Rep. Dennis A. Rossalso announced Wednesday that he is retiring this year. Who else is calling it quits? Keep track with Roll Call’s Departing Members list. We have the pleasure of hearing Nathan’s one-liners in the office. Now you, too, can pretend you work within earshot of the Inside Elections mastermind. He summed up his thoughts on some of the week’s political stories with (mostly) one-liners. Get his take on everything from the Florida Senate race to “Roseanne” here. What’s it like to drive with Todd Rokita? Simone found out when she took a spin with the congressman in Indiana last week. Rokita earned some flak last year when a memo listing his driving demands was leaked to the press, detailing how he needs a black coffee ready for the drive, how he should be notified of any turns and kept away from too many reporters. The memo also detailed a box of supplies known as “the football” that has to travel with him wherever he goes. Simone put Rokita in the hot seat (aka the passenger seat) about the memo. Read and watch more here. Whoever emerges from the seven-way GOP primary in Indiana’s 4th District on May 8 is likely coming to Washington next year. Rokita is vacating the seat after four terms to run for Senate. The contest is down to primarily three Republicans, each with a different style. Army veteran Diego Morales says he emigrated from Guatemala “the right way” and thinks he’s best positioned to diversify the GOP. He touts himself as a former senior aide to Gov. Mike Pence, but there’s some controversy over his work history. Former state Rep. Steve Braun is a data-savvy businessman and now “gentleman farmer” who voted in the 2008 Democratic presidential primary but can’t recall for whom. State Rep. Jim Baird is a Vietnam veteran who’s touting his long-standing ties to the district but isn’t sure he’ll air any ads. Read more about the field in this dispatch from Plainfield, Indiana. For next week, email us at attheraces@cqrollcall.com and let us know which race you want to know more about: Utah’s 4th District or New Jersey’s 4th District. Contrary to an awkward moment during a swearing-in ceremony, Paul Ryan proved at a CNN town hall that he does know how to dab.